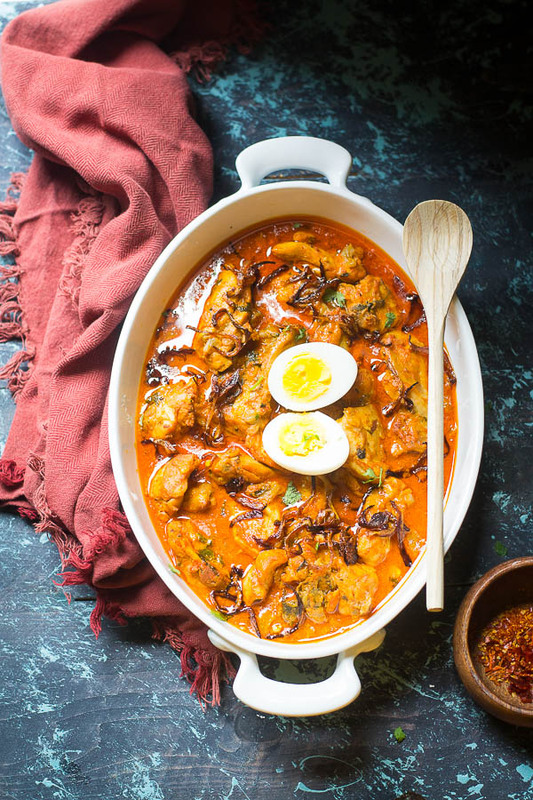 Today I am going to share a special chicken preparation called Dum Ka Murgh. This one is originated from Hyderabad and highly influenced by Mughals. There is slight difference between Hyderabad cuisine from rest of the India’s Mughal influenced styles. It seems the Nizams of Hyderabad preferred their food to be more spicy and it resulted in a distinct Hyderabadi Mughal cuisine. 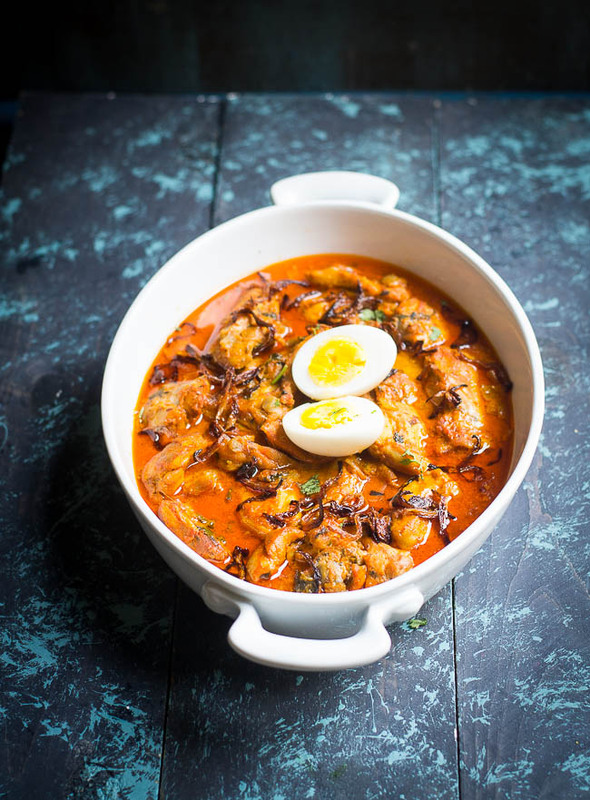 This particular dish is also called Lagan ka Murgh. “Lagan” means the wide and heavy-bottomed Indian utensil. Traditionally this recipe is cooked and served with this kind of pot. This dish is prepared by the technique of “Dum”. In this process, the dish is sealed with dough and gently simmering over a very low flame. It helps to increase the absorption of aromatic spices. 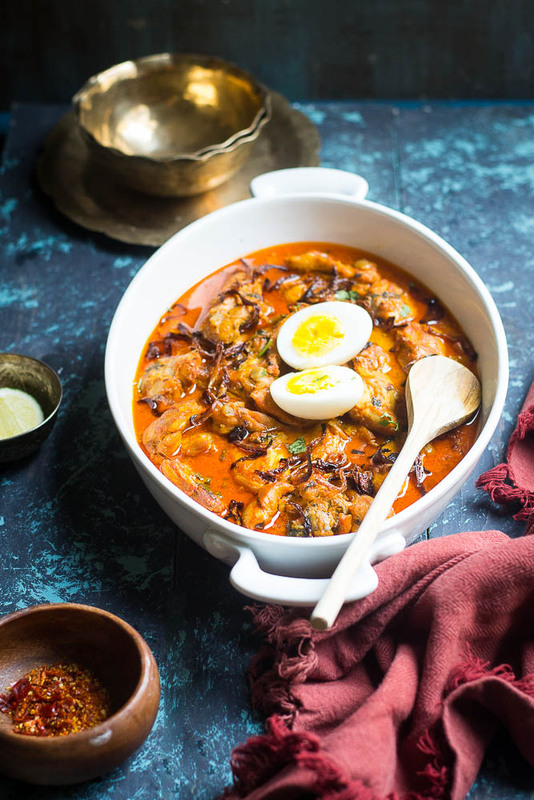 It is a very rich, aromatic and flavorful dish; chicken first marinated with lot of spices, yogurt and almonds / cashew paste then slow cooked in slow cooking method. There is a saying in Hyderabad cooking patiently is the key, slow cooking is the hallmark of hyderabadi cuisine. Since I am not very familiar with this kind of cuisine, I cannot vouch for the authenticity of this recipe. But I can assure you that this delectable and flavorful chicken dish will compel you to lick the plate till it becomes clean. 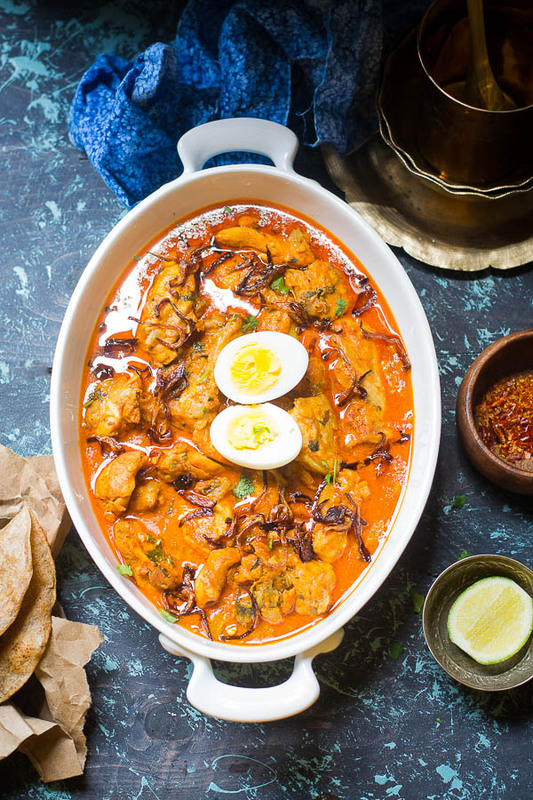 You can serve Dum Ka Murgh dish with Naans, Plain rice or Parathas. 1. Take poppy seeds and cashew nuts and put it into the blender. Add water and make a paste. 2. Wash and pat dry chicken pieces with paper towel. Take a big mixing bowl, add chicken, cashew and poppy seeds paste, ginger - garlic paste, green chili paste, fried onions, yogurt, red chili powder, kashmiri red chili powder, coriander powder, turmeric powder, salt, chopped cilantro, chopped mint, lime juice and oil. Mix it well and let it rest for 2 to 3 hours. 3. Take a big pan and heat it up. Add the remaining oil add cardamoms, cinnamon, and cloves. Once smell comes up, lower the flame and add the marinated chicken. Add half cup of water, ( optional if required as gravy ). 4. Cover it with lid and seal the lid with dough. Cook it over a medium flame for about 10 minutes, then reduce the flame and let it cook in a slow flame for about 30 minutes. 5. Switch off and leave it for another 10 minutes. Open the lid and serve hot with steamed rice or Indian flat bread. Few days back I saw a video on Facebook showing what all an Indian student would pack when he goes abroad first time. The list includes all popular Indian snacks and pickles. This made me nostalgic and reminds of my same habit. Whenever I returned back from home, never forgot to bring several packs of Aam Shotto. This might have been true for my other Indian friends, more likely if he or she is from Bengal. The Bengali people are so crazy about it that they even make Aam Shotto'r chatni with it. In rest of the India, it's known as Aam Papad. 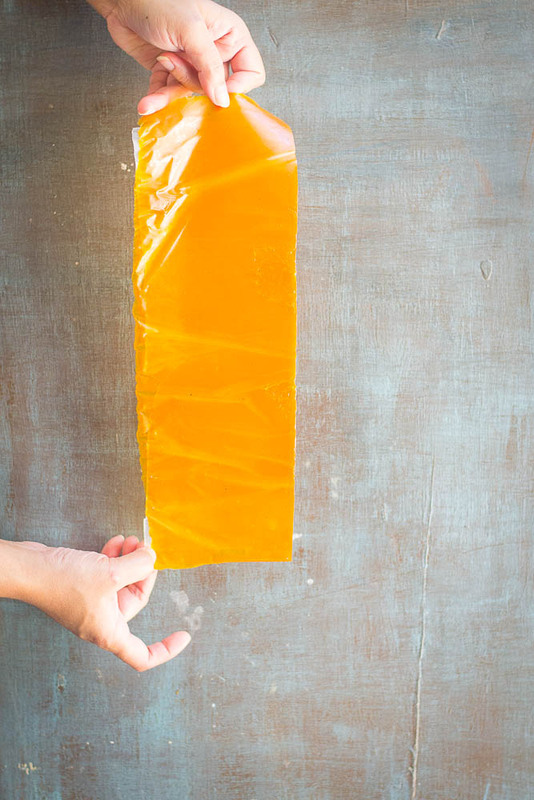 It is more like fruit leather or fruit roll-up that is made out of mango pulp and tastes sweet, soft and chewy. 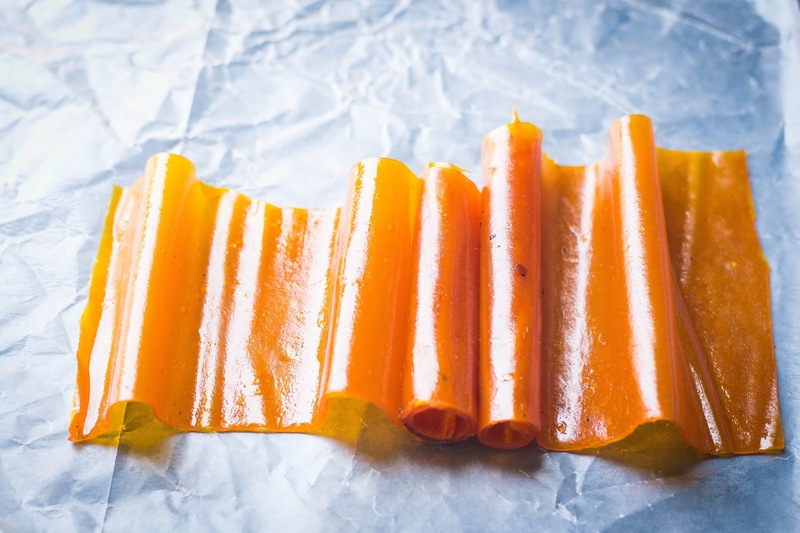 Fruit leather is nothing but a puree of fruit. It is thinly spread and sun dried or baked until it becomes dry. Then it is cut into pieces and wrapped in oiled paper or shaped into different form of packages. Sometimes it is preserved for a long time and can be consumed in off-season when mangoes are not available in market. In USA, Fruit leather / Fruit roll-ups is a brand of fruit snack that is available in grocery stores here and very popular among kids. I have seen fruit roll-ups with different kinds of fruits but didn't see mango version of the same. I had bookmarked some recipes of Aam Shotto a year back from Pinterest but didn't try until today. This week I had some overripe mangoes, so thought of giving it a try. 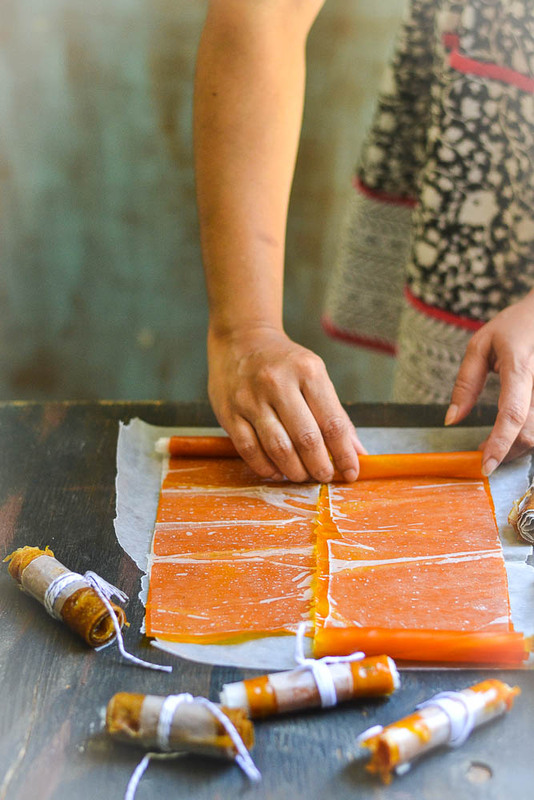 When I started to make Fruit leather on my own, thought it would be really a complex process. It turned out to be rather easier one. 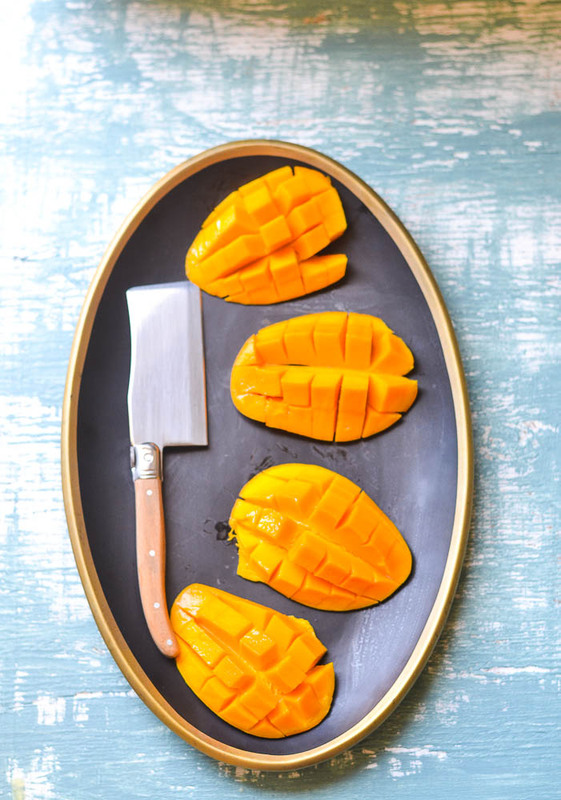 Though this particular recipe is made with mangoes, you can use any other fruit or combination of fruits. 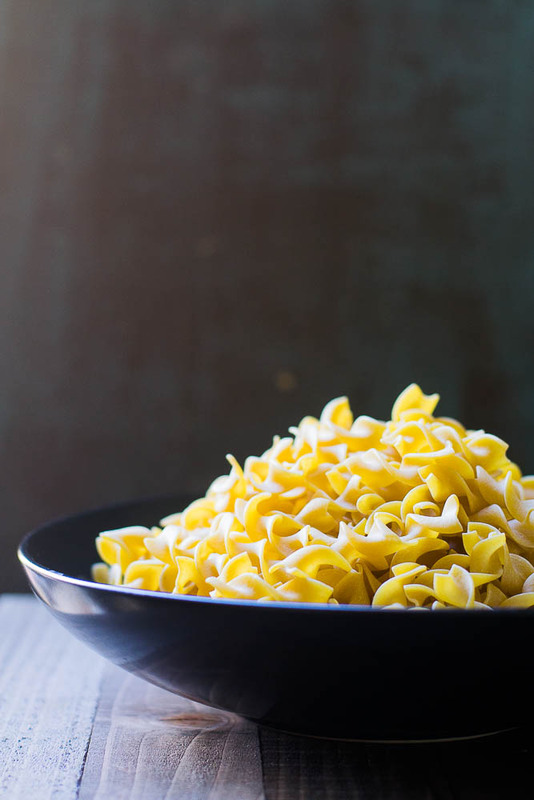 You don't need to add artificial colors or flavors or preservatives. 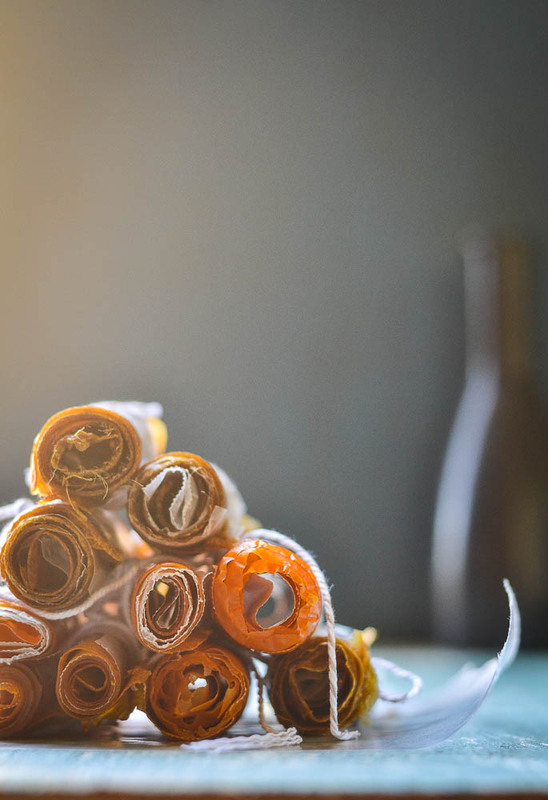 I can ensure nothing will go wrong and at the end, you will love the taste of this fruit leather. It would be far more healthier than what you will get in the market. 1. Preheat the oven to 175 degrees F . Line two baking sheets with parchment paper. 2. Add diced mangoes to a food processor or a blender and puree the mangoes until smooth. 3. Divide the puree into the prepared pans. Take an offset spatula and spread it evenly. 4. Bake the puree for about 4 to 5 hours or until they are fully dried. 5. Remove from oven and peel off . 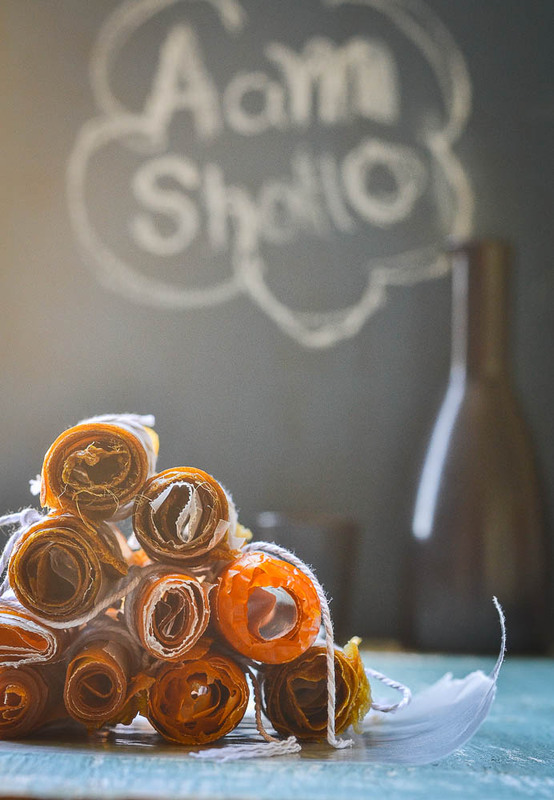 Cut into long strips and roll in parchment paper. 6. Store in airtight container or freeze it. 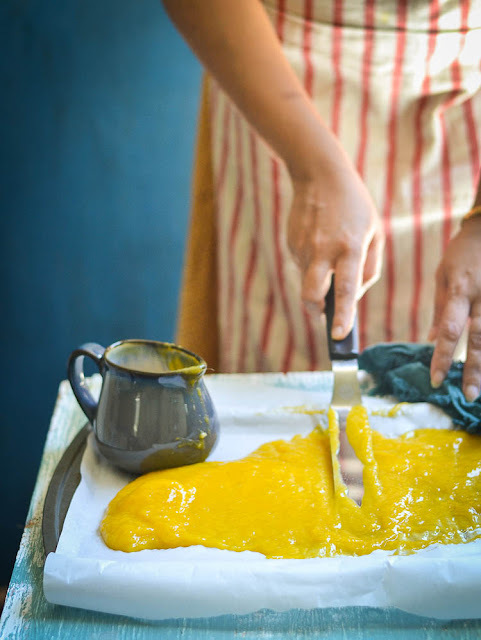 You can use store-bought mango pulp instead of fresh mangoes. The total baking time will vary on the thickness of your fruit roll-ups. It's quiet time in the morning again. No rush to prepare my son for the school. His summer vacation has started last week. The year went so fast, feel like it was yesterday when he started his 2nd grade in the new school. He was sad on the very first day of the summer vacation because he would miss his school friends. But now back in action with summer camp and weekend parties. Today I will share a recipe that is perfect match for summer vacation. I made this ice-cream for a party at my place couple of months back. Some of my friends asked for the recipe, so thought why not post the same on my blog. For Last couple of days I am trying to take pictures and post this recipe, but it took some time to shoot the photos. Sometimes my head goes blank and can't figure out how should I take pictures of a simple thing. Finally today I cracked it and hope you will like the snaps. 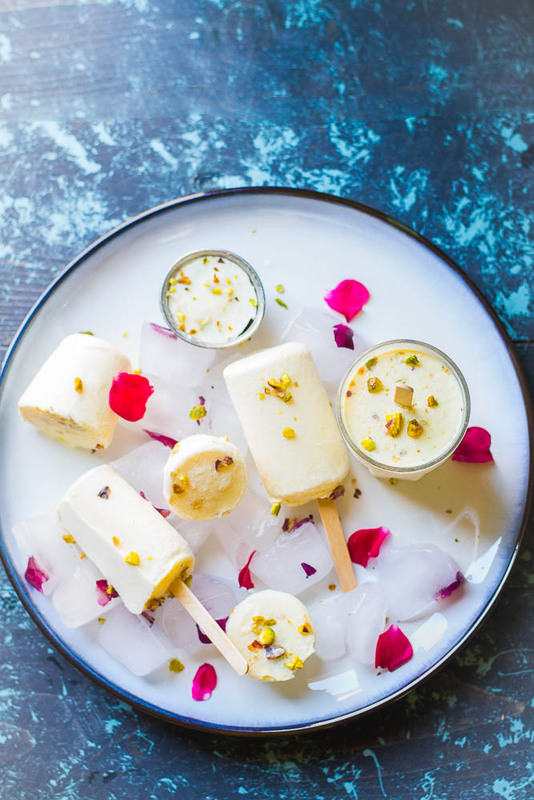 To my readers who haven’t heard about Kulfi, it’s an authentic Indian version of ice cream, very popular even today competing well with branded western ice creams. 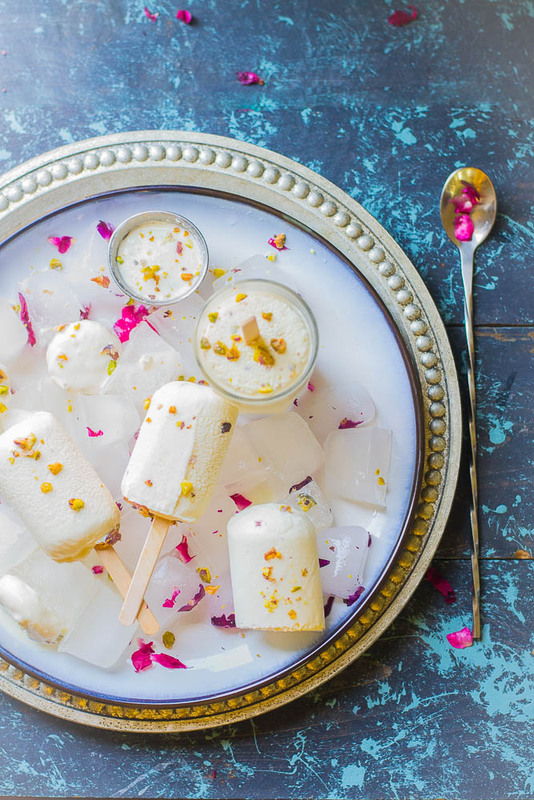 Every Indian has so much fond memories of having Kulfi with friends in childhood days. It’s so yummy when it is served with Falooda (starch vermicelli) and rose water. It is solid like custard-based ice cream and it takes a longer time to melt than western ice-cream. For this ice cream, you don't need any ice cream maker to whip or churn it. 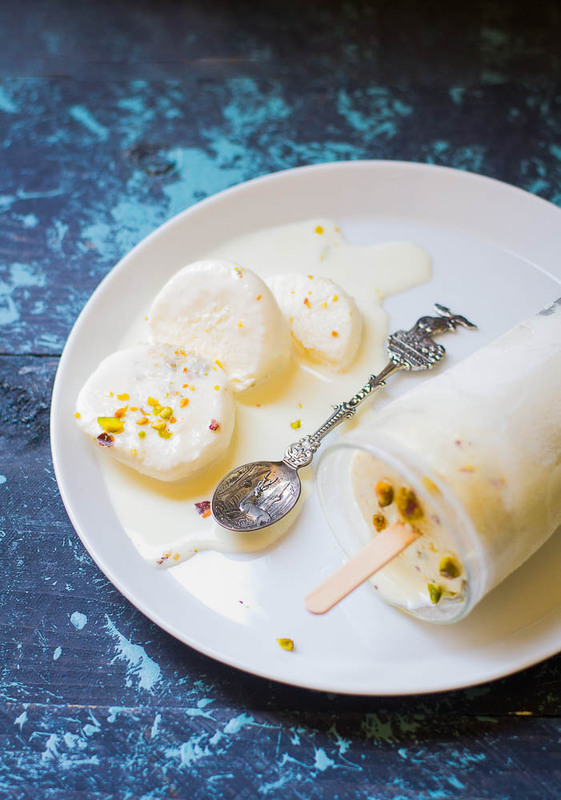 Kulfi takes longer time to melt than western ice-cream. It is dense, creamy and comes in several flavors. 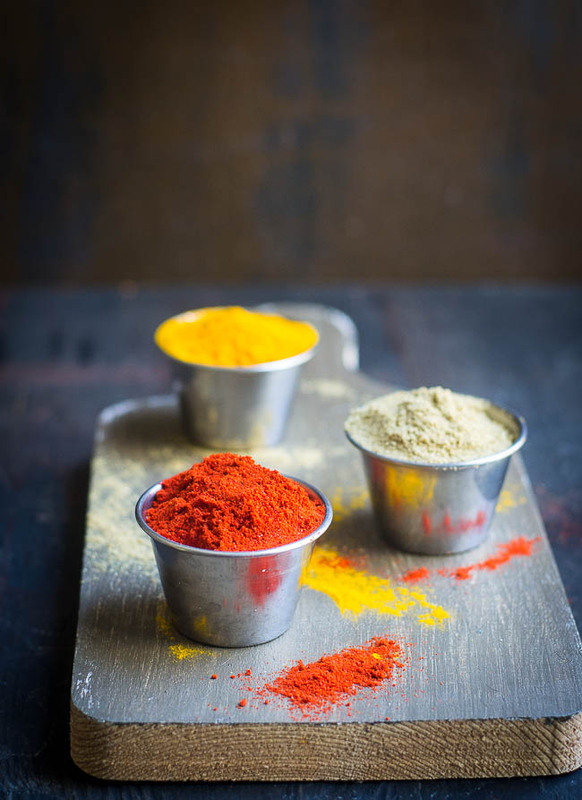 The most common flavors are rose, mango, malai, saffron, cardamom and pistachio. Green cardamoms : 1 teaspoon, crushed , or cardamom powder : 1/2 teaspoon. 1.Take a mixing bowl, add condensed milk, evaporated milk and heavy whipping cream. Mix it well. 2. Add crushed green cardamoms and and chopped pistachios. Mix it again. 3. Add the saffron milk mixture and stir it. 4. 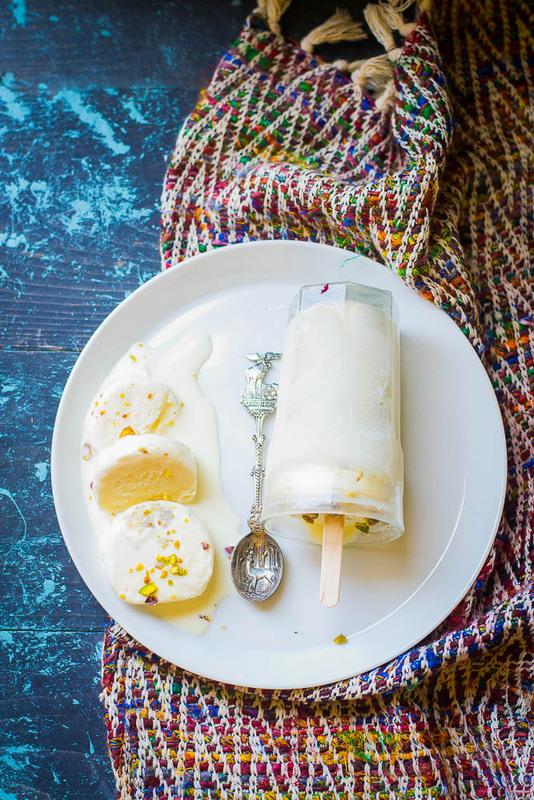 Pour the kulfi mixture in kulfi molds or popsicle molds or in a serving bowl or in small tumblers. 5. Cover with plastic wrap or aluminium foil and keep it in the freezer until it sets. 6. 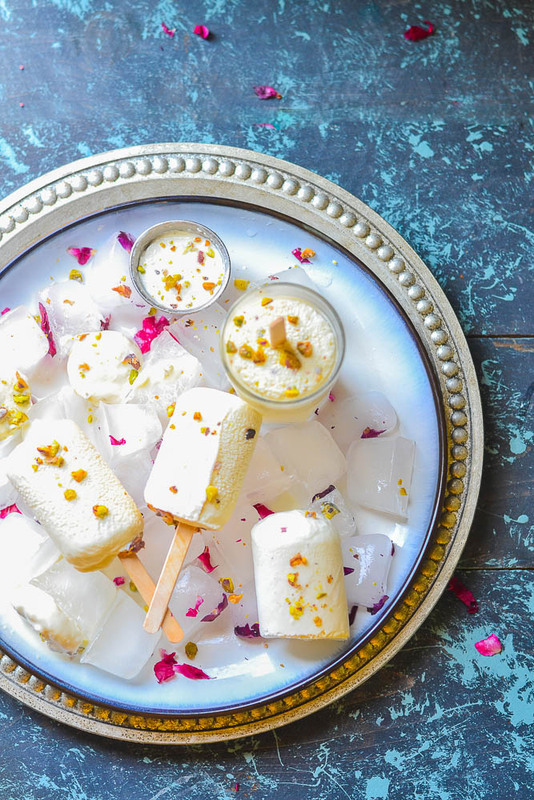 Once the Kulfi is well set, unmold it by sliding a butter knife at the edges. Or dip in some warm water and quickly remove it on a plate. 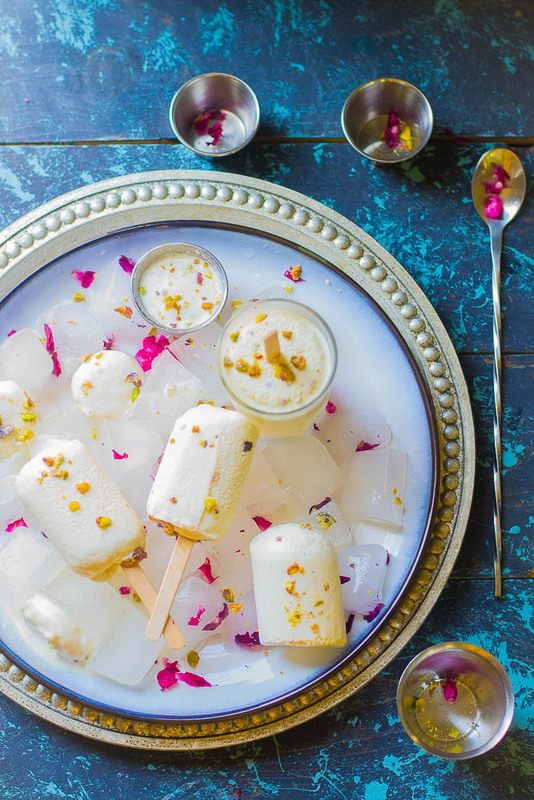 Slice the kulfi, add falooda ( starch vermicelli ) and rose water or rose syrup and serve immediately. Today's recipe is not the right one for my friends in India who are suffering from scorching heat currently. I feel guilty when I talk to my parents over phone while they complain about the hot and humid weather over there and here in San Diego, I am wearing a jacket. 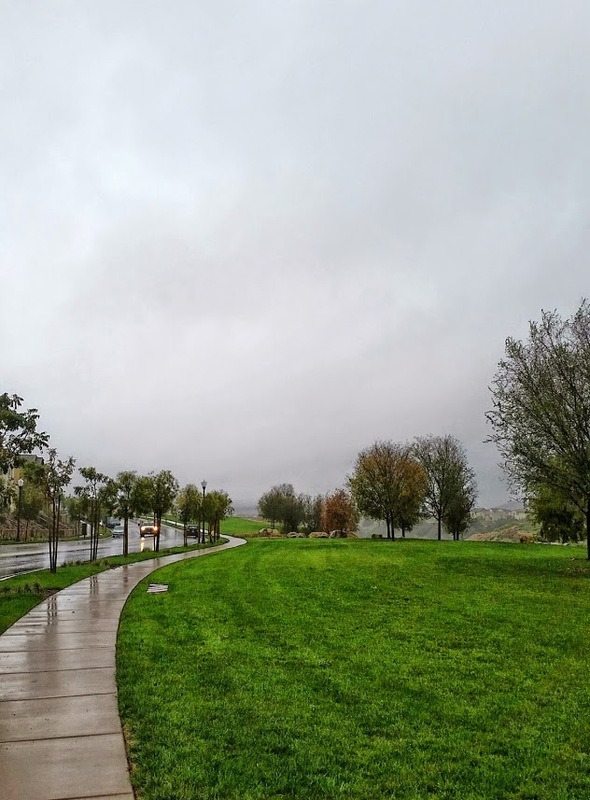 Unlike last year we are fortunate here in San Diego that warm days haven't started yet. 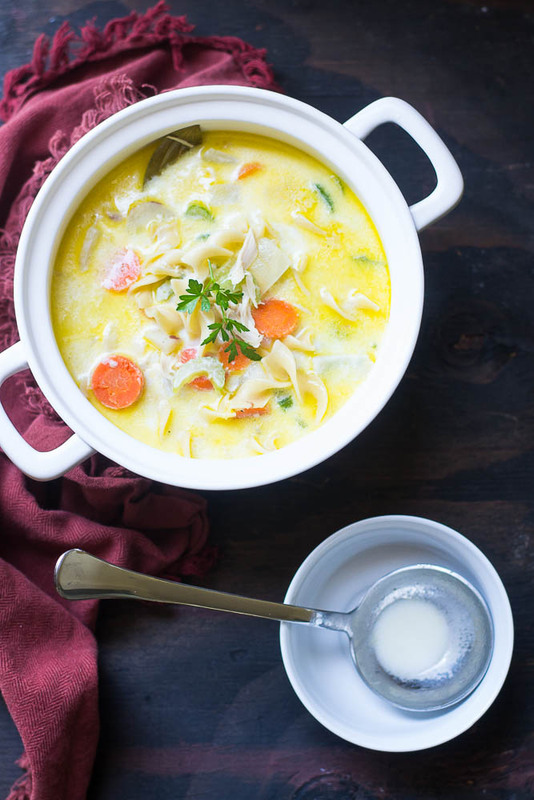 It's raining every alternate week and for last few weeks, temperature is under 70 F. So it's perfect for a warm bowl of comforting soup. Actually I don't need any specific weather to make soup. 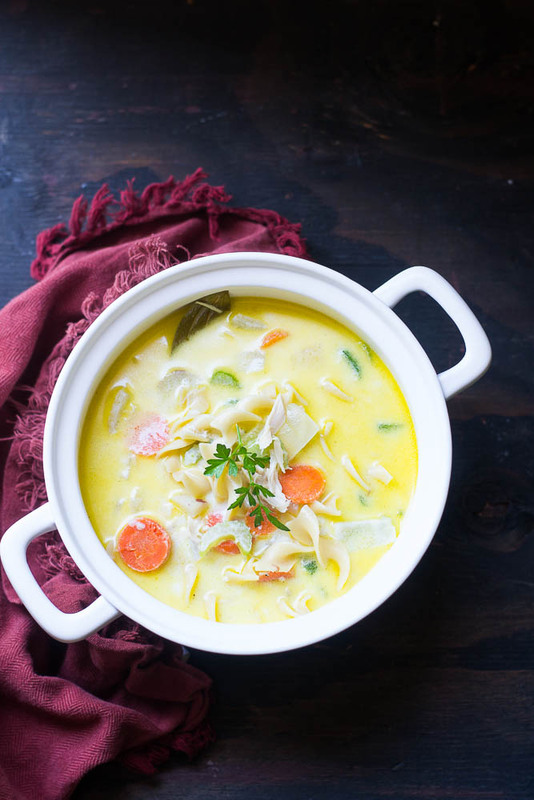 Whether it is summer or winter, a bowl of soup can bring smile on the face of my seven years old always. On regular days I don't get time to prepare something special for him. But on that day I had freshly made chicken stock and left-over veggies were there in my refrigerator. So thought of making Chicken Noodle Soup. 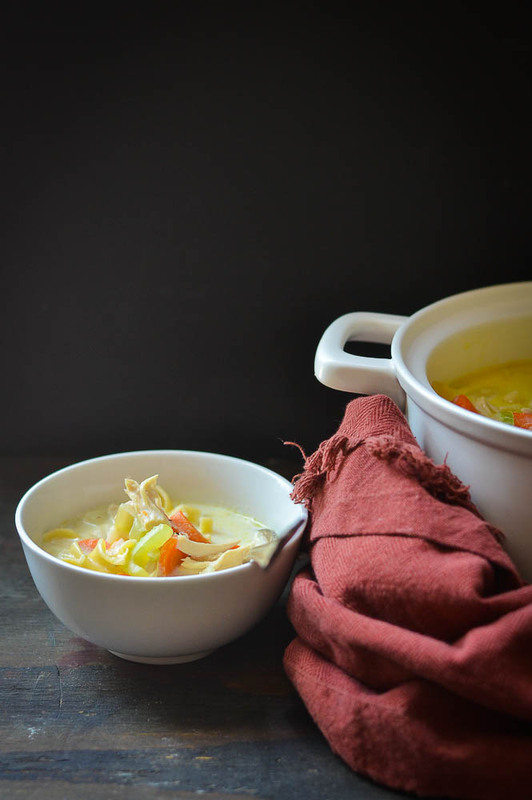 When I asked my son about which one he will prefer between Regular Chicken Noodle Soup and Creamy Chicken Noodle Soup, he opted for the second one, as we generally have the regular one more often. 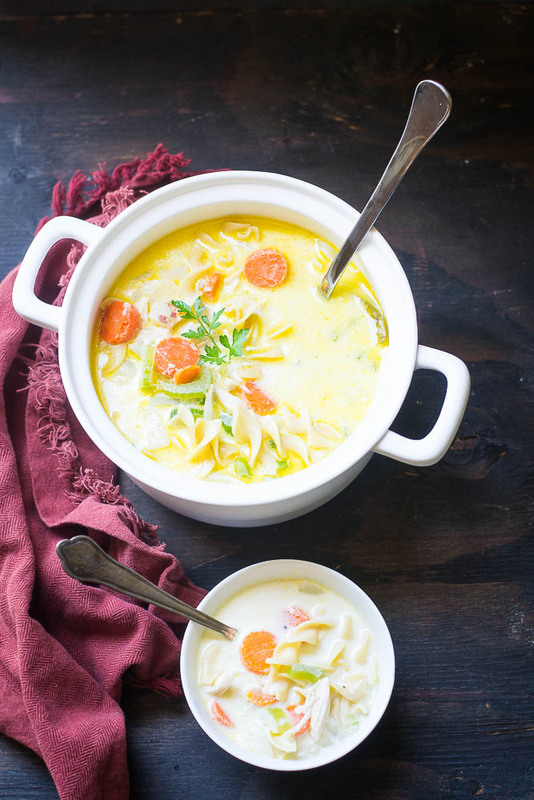 Chicken Noodle Soup is perfect one-pot meal, packed with chicken, noodles and veggies and so easy to prepare. 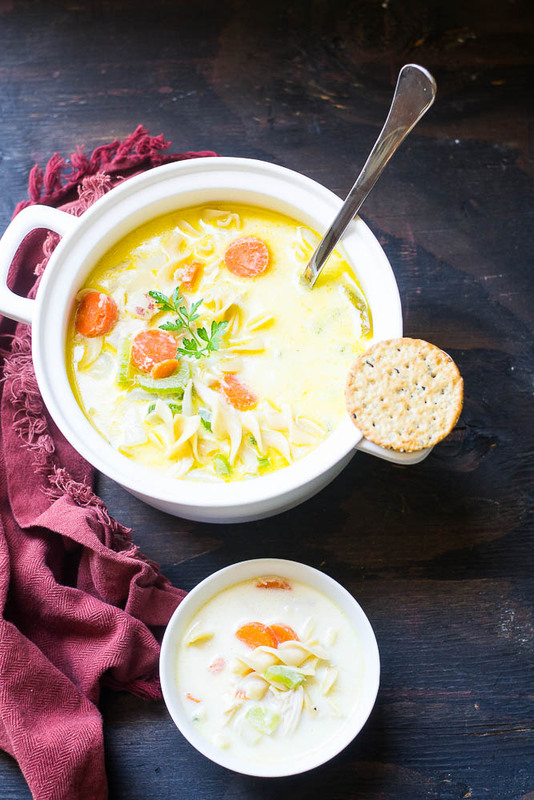 It takes around only 15 minutes from start to finish and the end result is a pot of warm, hearty and very delicious soup. It will warm the cold nights in no time and surely will bring smiles to your kids. The recipe is adopted from "cooking classy" . Boneless skinless chicken breasts : 1 lb , cut into thin slices. 1. Cook the noodles as per package directions. Drain and set aside. 2. In a large pot, heat olive oil over medium heat. Add onion, carrot, celery and sweet potato and saute for couple of minutes. Add garlic and stir it. Add chicken broth, parsley, bay leaves. 3. Add chicken breast and bring soup to a boil over medium-high heat. Add salt and pepper. Reduce the heat , Cover it with lid and let it cook. 4. 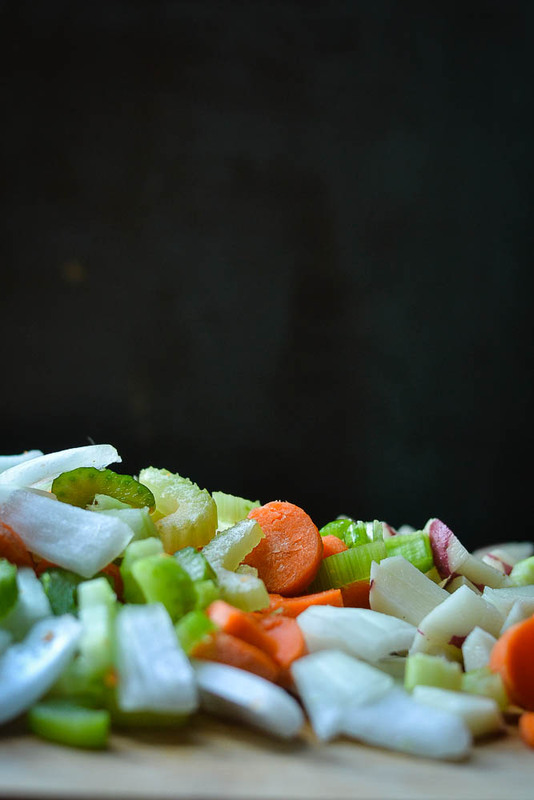 Once chicken breast is cooked, remove it from the soup and shred it into bite size pieces. 5. Take a pan and heat it up. Once butter melts add the flour and stir constantly. Add milk and stir it to break the lumps. Add cream and whisk it. 6. Now pour the milk mixture into the soup mixture. Add the shredded chicken and cooked noodles to the soup. Stir it to mix. 7. Serve warm with bread or crackers.